I finally got my Bubba Grills 250R today. 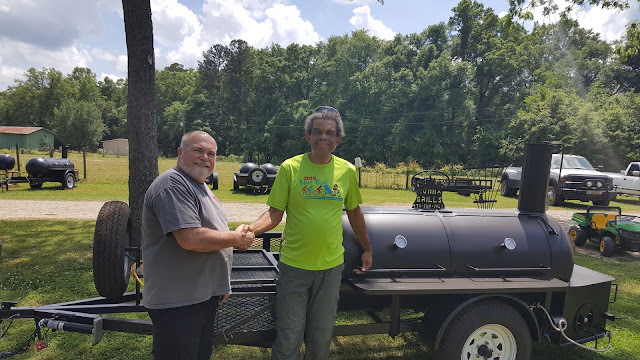 It was nice to meet +Lonnie Smith today and get some pointers on using the grill. Wondering what all this reverse flow business is all about? Check out stickburnermafia.com for more information. Lonnie Smith (left) gives me a hand shake to seal the deal on my smoker. The trailer pulls real nice. I was doing 70 MPH on I-&% on the way home and the trailer tracked true and steady.